This course is devoted to the various methods and techniques available for more accurately determining the amount of asbestos in bulk samples, including roofing felts, floor tiles, cementitious material, etc. Included is the CARB 435 soil preparation method from the California Air Resources Board. Industry-accepted and -proven gravimetric methods are also covered. Weight-percent standards are prepared and evaluated to serve as in-house reference material for QA/QC procedures and to fulfill AIHA or NVLAP guidelines. 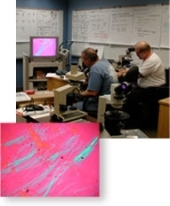 The course includes sample preparation techniques, point counting and other relevant protocols that allow analysts to quantify at lower levels. Students also learn to compare percent determination by area, volume and gravimetric methods.